The SITREX Tedders are ideal machines to spread, air and turn all types of forage in any type of terrain. Due to the number of models available and its versatility, the SITREX Tedder has been used for over 30 years in small and large farms and has been found efficient and reliable. 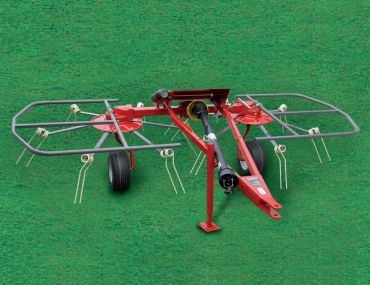 The Tedder allows a perfect and even spreading of forage. Tines pick up a small quantity of forage on every turn of the rotor and lay forage on the ground perfectly aired without damage or dirt. All models can be supplied with fix three point hitch or towing drawbar. The 4 rotors Tedder is also available in hydraulic version, with hydraulic lift system on the two outer rotors. The hydraulic Tedder version allows the operator to put the machine in working or transport position through the tractor hydraulic system. Number Of Revs During Work 350-450 R.P.M.